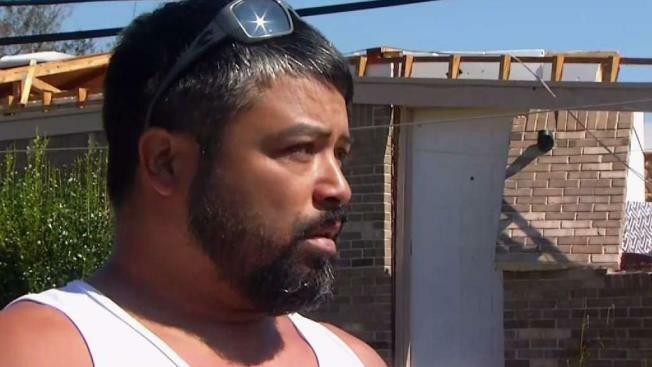 A couple in Panama City is determined to stay strong after Hurricane Michael destroyed their home months after the unexpected death of their 9-year-old son. NBC 6's Jamie Guirola reports. Their home full of soggy furniture and mosquitoes, Wilmer Capps was desperate to find shelter for his wife and their son Luke, born just three days after Hurricane Michael ravaged the Florida Panhandle. Luke is healthy and so is Smith, his mom. But she said her newborn deserves better than the stormy life he's had so far. "We had everything. Full-time job, a place to live. One day we had it all, the next we had nothing," said Smith. "This is not what I thought I'd be bringing him back to." The story of Luke's birth is just one amid the chaos that life has become in areas of the Florida Panhandle hit hardest by Michael. With the hurricane bearing down on their native home of Panama City, Capps and Smith sent their three other children to stay with relatives. Doctors had planned to induce labor on Oct. 11, the day after Michael made landfall between here and Mexico Beach, wiping out a wide expanse of buildings and timber. Smith went to the hospital as planned that day, courtesy of a ride in a police car along streets crisscrossed with downed trees and powerlines. Smith said workers at Gulf Coast Regional Medical Center told her they couldn't deliver a baby that day, so she walked several miles (kilometers) home after being unable to find a ride back. Anya Mayr, a Gulf Coast Regional spokeswoman, said the hospital has operated only as an emergency room and hasn't admitted patients since Michael. About 560 people have been treated for injuries ranging from storm wounds to heart attack and chainsaw cuts, she said, and more than 170 have been transferred to other hospitals by ambulances and helicopters. Labor pains started the next day, so Capps drove Smith to a hospital about 80 miles to the north in Dothan, Alabama, which was flooded with coastal refugees from Michael. She gave birth at 1 a.m. last Saturday, three days after Michael's landfall. 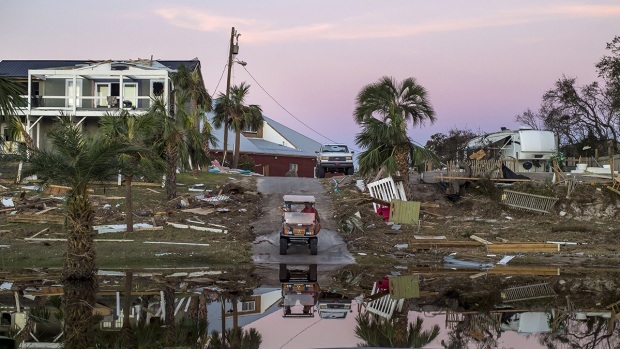 Discharged from the hospital and unable to find a hotel room nearby, the couple drove back to Florida, where conditions had improved only slightly since Michael. Still unable to stay at their storm-damaged home amid oppressive heat and bugs, Capps settled on the Walmart parking lot because they were low on gas and were fearful of driving at night with a curfew in place. The store has a reputation for letting travelers sleep in the parking lot overnight, and Capps knew it. "I had no choice, (Luke) would have had a heatstroke. When he started acting like he was getting sick from the heat and wouldn't eat, that's when we went to Walmart," Capps said. "There was kind of a breeze there, there was no bugs biting us. I said 'We're all right now." Police officers who showed up after the AP photographer realized the couple's plight and escorted them back to Gulf Coast Regional, where workers checked out Luke but couldn't provide a bed for the night, frustrating Capps. Fearful of safety and sanitation problems at a shelter suggested by workers from the Federal Emergency Management Agency, the family returned to the Walmart lot. There, they met a security guard who helped secure them a hotel room in nearby Panama City Beach with air conditioning, water and power Tuesday night. Capps doesn't know how long the aid will last, but he intends to repay the donation. Pulled back from the brink after doubting the kindness of humanity on that night in the parking lot, Capps still has little money and no permanent home. But things are looking up because of the kindness of strangers. "These people have been a godsend, because otherwise we'd be back in the parking lot tonight," he said.